This summer school is about learning the different skills required for building agent-based models for renewable resources management. 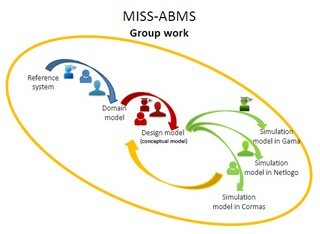 It is oriented towards a participatory use of models and simulation and participants will be asked to work in small groups. Agropolis International wishes you a happy New Year! The HNV-Link project (High Nature Value Farming: learning, innovation and knowledge; H2020, 2016-2019, www.hnvlink.eu) will hold its Final Conference on 31 January 2019 at CIHEAM-IAMM in Montpellier. 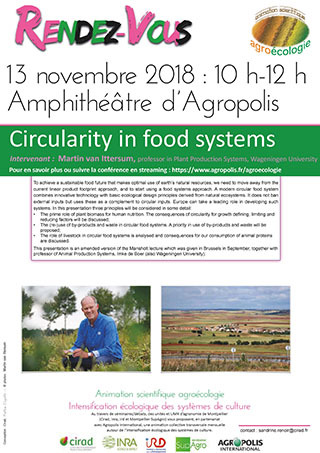 Save the date : Scientific animation on Agroecology - Ecological intensification of cropping systems November 13, 2018, 10h00, Agropolis International, Montpellier (France)"Circularity in food systems / Martin van Ittersum, professor in Plant Production Systems, Wageningen University"
This issue of ‘Les dossiers d’Agropolis International’ thus showcases the scientific actors conducting research activities related to complex systems throughout the Occitanie region—for the first time. The scientific community includes 44 research teams (research units, service units, hosting and project teams, and observatories). Several federative research bodies oversee the scientific activities of the teams: an institute, six laboratories of excellence (LabEx), an equipment of excellence project (EquipEx) and a Convergence Institute. Finally, several French national and European research infrastructures and data and computation centres essential for managing complex systems are also based in Occitanie. This Dossier will provide readers with an overview of these regional scientific stakeholders through specific examples of activities they develop in relation to complex systems in three main thematic areas: Data collection and management; Understanding and analysing complex systems; and Different applications of the complex systems approach. 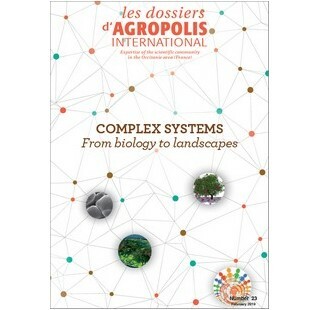 The Dossiers d’Agropolis International collection is a flagship vehicle for presenting and promoting the expertise of Agropolis International members on major scientific issues. Each Dossier is devoted to a specific theme. The research units and training courses concerned are showcased, alongside the research and associated results. Contributions of civil society, the economic sphere and local authorities in the target areas are also highlighted. Next issues (to be published in 2019) : ‘One Health: scientific skills in Occitanie for a Global approach’ ; ‘Marine sciences and coastline’. How can we best use land to ensure food and nutritional security for all? It will ba a hard, long and narrow road, and above all, it means a change in direction. This is demonstrated in a book on the Agrimonde-Terra foresight study, Land Use and Food Security in 2050: a Narrow Road. 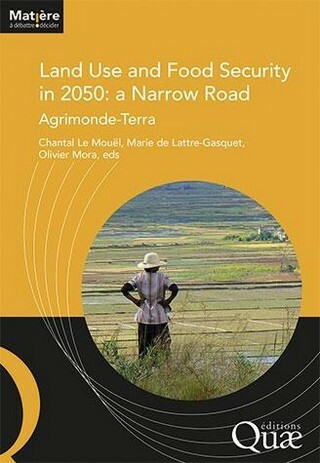 The book gives details of the four-year study by CIRAD and INRA , backed by a number of experts from all over the world. After an initial study on global food security in 2050 (Agrimonde), CIRAD and INRA switched their attention to a new foresight exercise, centring on land use in the light of the challenge posed by ensuring food security in 2050. The new study, entitled Agrimonde-Terra, pinpointed levers likely to modify existing land use patterns with a view to boosting food and nutritional security. The Mediterranean Centre for Environment and Biodiversity Laboratory of Excellence (CeMEB LabEx) is a federation of ten research units in the Montpellier area. Research focuses on the dynamics and functioning of biodiversity and ecosystems in a context of marked environmental change, notably due to human activities. The CeMEB LabEx is part of the 2011–2019 Future Projects Investments (Projects Investissement d'Avenir 2011-2019) program, funded by the French National Research Agency (Agence Nationale de la Recherche). Scientific coordination : Nicolas Arnaud (CNRS), Bertrand Jouve (CNRS), Jean-Pierre Müller (Cirad). It is now possible to map diseases in regions for which epidemiological data are scarce. Spatial multi-criteria evaluation is a rigorous method that is quick to implement, and was developed by CIRAD and its partners. Animal health and veterinary public health policymakers are still relatively unfamiliar with this method, but it is suited to regions with little access to reliable epidemiological data, such as low-income countries in the South or disease-free areas. Animal diseases and zoonoses - infectious diseases that can be transmitted between animals and humans - are a global socio-economic and public health problem: ensuring the surveillance and control of these diseases means identifying high risk areas in both North and South. This series of 4-page summaries published by CIRAD which presents novel ideas or policies on development issues of strategic importance for countries in the South: food security, land tenure, climate change, energy security, forest management, standards, etc. Authors : Annelise Tran and François Roger. Agroecology in Latin America emerged in response to the social, economic, environmental and climate crises observed in conventional agriculture. It is driven by social movements and is gradually being taken into account in public policies. These policies involve a range of instruments that are often embedded in programmes that also support organic agriculture and sustainable agriculture, types that unlike agroecology do not question the basis of the conventional agri-food system. This issue of Perspective analyses these policies and their influence on the development of agroecology in eight countries: Argentina, Brazil, Chile, Costa Rica, Cuba, El Salvador, Mexico, and Nicaragua. These policies remain fragile, while support for large-scale conventional agriculture is still predominant, and implementing instruments in favour of agroecology thus depends on the power relations in each country. The challenge is therefore to convince more broadly farmers, consumers and policymakers about the importance of issues such as public health and food security. The 25th issue of "The Dossiers d’Agropolis International series", to be published at the end of 2018, will present an overview of research & development projects and training activities carried out in the One Health sphere by scientific organisations in the Occitanie region. Global approaches to health – defined by the "One Health","EcoHealth" or "Planetary Health" paradigms – postulate that the epidemiological dynamics of diseases and the impact of the various drivers that determine the health of animal, plant and human populations should be studied in inter-connection and in link with their ecological, socio-economic and political contexts. The scientific community of the Occitanie region in the South-West of France works within this integrative framework, focusing on regional – in connection with the Mediterranean area – national and international issues, including tropical contexts and diseases. Research projects are conducted in close cooperation with a number of partners across the world. The Dossiers d’Agropolis International series is a deliverable of Agropolis International that is produced within the scope of its mission to promote expertise of the scientific community. Each Dossier is devoted to a broad scientific theme, and includes a clear overview that is a ready reference for all laboratories and teams associated with Agropolis International that are conducting research on the target theme. Publication of a new "Dossier thématique du CSFD" on "Ecological engineering for sustainable agriculture in arid and semiarid West African regions"
The 11th issue of Les dossiers thématiques du CSFD (Comité Scientifique Français de la Désertification/French Scientific Committee on Desertification) looks at potential contributions of ecological engineering to the management of agrosylvopastoral systems in sub-Saharan drylands areas. It helps to describe and define agroecological practices. Based on the authors’ and contributors’ experience, West Africa is focused on to illustrate the ecological intensification to agricultural production in the broad sense. Examples from non-African tropical dryland areas worldwide are also discussed to illustrate the potential of agroecological engineering to sustainable land management and therefore to the fight against desertification. Dominique Masse (Agronomy-Ecology, IRD), Jean-Luc Chotte (Soil Ecology - Microbial Diversity, IRD) and Eric Scopel (Ecological engineering, Cirad), coordinated this Dossier. 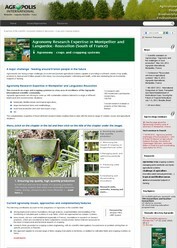 CSFD is hosted and managed by Agropolis International. This conference hosted by Eric ANDRIEU, S&D Coordinator for Agriculture and Rural Development, was organised by Agropolis International Association and several member institutions-Bioversity International, CIHEAM/IAM.M, CIRAD, CNRS, INRA, IRD, IRSTEA, Montpellier SupAgro-. -Open to the Euro MPs, European officials of the various DG of the European Commission (Agricultural and Rural Development ; Research & Innovation ; International Cooperation and Development)and to permanent representatives member states. Present some achievements of the regional Agropolis scientific community in Montpellier focusing on flagship projects, in partnership with European and South organisations. New Caledonia is about to take an institutional and political corner in a world that has changed radically since the start of the fight for decolonization. This remarkable book is the fruit of a unique multidisciplinary study. On the eve of a decisive consultation, it provides keys to understanding the economy of New Caledonia, its changes over the past 30 years or so, and the issues and prospects for the future. Jean-Michel Sourisseau, a researcher at Cirad, Montpellier (France) is among the scientists who wrote this book. See the seminar video of Emile Frison (Member IPES-Food Panel) Agroecology seminar october 2016 "From Uniformity to Diversity: A paradigm shift from industrial agriculture to diversified agroecological systems"
This Dossier presents the scientific structures based in Languedoc-Roussillon area (France), members of the Agropolis International scientific community, whose activities are focused on training, research and innovation regarding viticulture and wine. How will agricultural land occupation change in the coming decades? As a result of which factors? How will the tensions between food security and climate change mitigation pan out? The Agrimonde-Terra foresight study, conducted by scientists from CIRAD and INRA with the support of global experts, set out to answer these questions via five land use and food security scenarios. The results of the Agrimonde-Terra foresight study, presented on 24 June in Paris, highlight the main levers for action, in particular the need for global land use governance that takes account not just of the agricultural and food sectors, but also other economic sectors. This should involve all the various stakeholders, and result in more diversified diets, new international trade regulations, more integrated crop and animal production systems and guaranteed access to land for a wide range of agricultural structures. 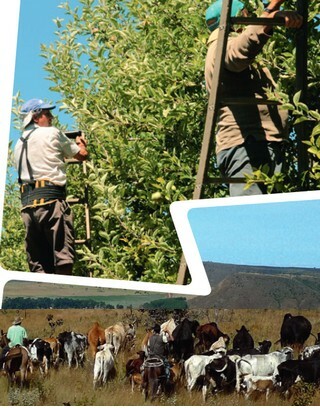 Just published : "Dossiers d'Agropolis International" - Number 22 (April 2016 , 72 pages) Special issue on PARTNERSHIP (in French) "Agricultures familiales et recherche - Regards croisés Argentine, Brésil, France" Issue realized with the partnership and support of INTA and EMBRAPA. This issue of Agropolis International Dossier is a report on the presentations and discussions which took place during the seminar "Research, development and innovation for the Family Farming in the South" (4th June 2014, Montpellier-France), organized by Labex-Europe of EMBRAPA, Labintex of INTA and Agropolis International. This seminar has been organized in parallel with the International Encounters held between 1st and 3rd June 2014 in Montpellier; it allowed the participants to interchange over the challenges faced by research for the family farming in Argentina and Brazil and consider future lines for research and cooperation performed between Agropolis International, Labex-Europe of EMBRAPA, Labintex of INTA and the French research institutions. This Dossier on viticulture and wine presents the scientific stakeholders based in Languedoc-Roussillon region (France), members of the Agropolis International scientific research community, involved in training, research and innovation on viticulture and wine. This Dossier will be published in English in 2016. The latest issue of "Les dossiers d'Agropolis International" n° 21: "Vigne et vin" (vineyards and wine) has been presented at SITEVI* in Montpellier and handed over to Stéphane LE FOLL, French minister of Agriculture, Agrifood, and Forestry (24 November 2015). Just out : The new Montpellier Panel report "The Farms of Change: African Smallholders Responding to an Uncertain Climate Future"
In the latest report presented on Friday 25th September 2015, the Panel of Montpellier experts in agriculture and development warn of difficulties that might hamper development in Africa related to poor investment in climate change adaptation strategies dedicated to African small farm holders. As part of the International Year of Family Farming (IYFF) declared by the United Nations for 2014, the research institutions of Montpellier’s hub (Agropolis International) have taken the initiative to organize International Encounters on "Family Farming and Research".235 participants from 70 countries, including representatives of farmers, NGO, decision makers from the political and private sectors, and trainers and researchers, gathered in Montpellier on the occasion of these International Encounters. Languedoc-Roussillon and Avignon research skills concerning food, nutrition, health Eight years after the first Dossiers d’Agropolis International dedicated to the Food, Nutrition, Health theme, a review is necessary to show the evolution of research works led by the regional scientific community and to provide updated information to people interested in this theme. The series "Les dossiers d’Agropolis International" is a deliverable of Agropolis International, produced within the scope of its mission to promote expertise of the scientific community. English and Spanish Versions will be published shortly. This event has been organised by the two research labs UMR Innovation and UMR Moisa (that are joint research units from INRA, CIRAD and Supagro) in connection with the UNESCO Chair on World Food Systems and the research program SURFOOD (Sustainable Urban Food) funded by the Agropolis Foundation. Download the press release about the visit of the "Feeding the Planet" board in Chile. Eurochile organized a seminar that supports the strategic alliance between Chile and Europe in the food production area. 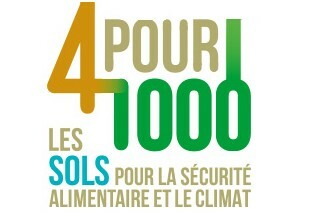 The World Day to Combat Desertification is Monday, 17 June On this occasion, the French Scientific Committee on Desertification (CSFD), hosted and managed by Agropolis International, launches the English version of its website devoted to knowledge dissemination to the general public. The series 'Les dossiers d’Agropolis International' is a deliverable of Agropolis International, produced within the scope of its mission to promote expertise of the scientific community. English and Spanish Versions will be published shortly. Joint Research Unit (UMR InterTryp - CIRAD, IRD) which develops prevention and control methods against infections by Trypanosomatidae, tailored to the constraints in developing countries. The series "Les dossiers d’Agropolis International" is a deliverable of Agropolis International, produced within the scope of its mission to promote expertise of the scientific community. Other | After more than 50 years of tropical silviculture research carried out in the major forested regions of the world, and in the framework of the International Year of Forests, Cirad, CIFOR and Ecofor organized this international conference under the auspices of IUFRO (Division 1.02.00 Tropical and Subtropical Silviculture; Division 3.07.00 Forest operations in the tropics ; Division 8.02.00 Forest Biodiversity). Other | Organized on September 12-13 2011 in Montpellier (France) at the initiative of the G20 French Presidency and in the framework of the pillar on Food Security of the action plan for development, the 1st meeting of the G20 development on Agriculture Research for Development was devoted to promoting scientific partnerships for Food Security. Other | E.Ostrom's works are one of the main reference for those who, in the scientific and politic worlds, are building their speeches and actions on the one hand only on state management, and on the other hand, on the promotion of private property as a universal tool for the management of resources and environment management. E. Ostrom's analysis presents the collective action and the auto-organization as a third alternative between privatization and state management. Other | See the highlights of the event "CGIAR Gender & Diversity Program launched African Women in Agricultural Research and Development (AWARD). Other | The seminar social LCA of Montpellier, is an extension to that which was held May 31, 2010 at DTU (Denmark) by Dr. Louise Camilla Dreyer. Its purpose is to review recent developments in some approaches to social LCA. This seminar is organized by CIRAD, CEMAGREF, Montpellier 1 University and the ELSA research group . Other | On the occasion of its five years of activity, GlobalHort presented to the scientific community in Montpellier and to its partners, the history, action plan and some current accomplishments of GlobalHort, before opening a debate on its perspectives for the future. Other | During this event, the recent report of the Montpellier Panel, headed by Sir Gordon Conway, was presented ; Financed by the Bill and Melinda Gates Foundation, the report urges Europe to scale up its efforts to develop agriculture to spur economic growth in Africa. Other | Download presentations of the European mid-term seminar EU-PEARLS. This meeting aimed to bring together researchers, industry representatives, and policymakers, interested in the development of alternative sources of natural rubber. Other | The final scientific seminar of the ARCUS project 2007-2010 (Ecology and sustainable development, Languedoc-Roussillon/China), was held on October 7th 2010 at the Auditorium of the French Pavilion at the World Expo 2010 in Shanghai (China). 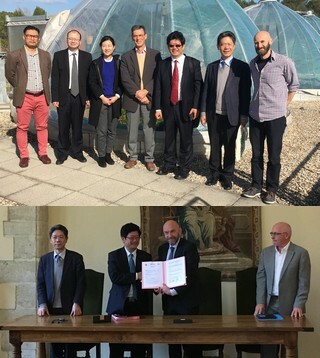 The ARCUS project, managed by Agropolis International, aimed at promoting scientific cooperation between French and Chinese stakeholders in ecology and sustainable development. Other | The first Global Conference on Agricultural Research for Development (GCARD) was organized by GFAR in collaboration with the Consortium and Independent Science and Partnership Council of the Consultative Group on International Agricultural Research (CGIAR) and Agropolis International. The Conference replaced the GFAR Triennial Conferences and the Annual General Meetings of the CGIAR. Other | TDWG was formed to establish international collaboration among biological database projects. TDWG promoted the wider and more effective dissemination of information about the World's heritage of biological organisms for the benefit of the world at large. Biodiversity Information Standards (TDWG) now focuses on the development of standards for the exchange of biological/biodiversity data. The seminar will explore consumption behavior and food chain dynamics as the result of the capabilities, strategies and environment of stakeholders in the food chain, including consumers. The seminar is organized by the joint research unit MOISA (Marchés, Organisations, Institutions et Stratégies d'Acteurs) which gathers lecturers and researchers from CIRAD, IAM.M, INRA, and Montpellier SupAgro. This congress takes place every five year and has never been organized in Europe before. 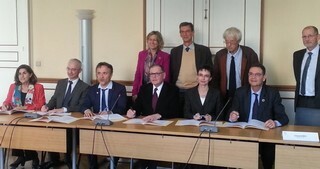 CIRAD and INRA are the main organizers, in partnership with the World Agroforestry Centre, Agropolis International and Montpellier University of Excellence (I-Site MUSE). More than a thousand participants from both temperate and tropical zones all over the world are expected. The Montpellier Fourth World Congress on Agroforestry will address a wide range of key agroforestry research issues. It will gather facts and figures from developing and developed countries and support a collaborative effort with broad social participation. World-known keynote speakers have been invited to make sure that today's important agroforestry research questions are all addressed. Nevertheless, the Congress also welcomes a variety of stakeholders to foster social interactions while special attention is given to vulnerable countries and populations. 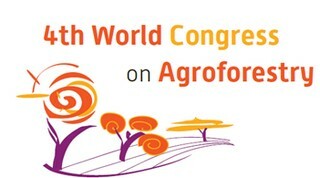 The overall objective of the Congress is to contribute to the strengthening of agroforestry science and practice in order to provide opportunities for further developing links between science, society and policy. Deadline for abstract submission: 31 October 2018. Registration : September 2018. 03-06-2019- au 07-06-2019 : Symposium « Third Jack R. Harlan International Symposium Dedicated to the Origins of Agriculture and the Domestication, Evolution, and Utilization of Genetic Resources"
Deadline for abstract submission:January 2019. Organized by several members of Agropolis International: CIRAD, INRA, IRD, Montpellier SupAgro, University of Montpellier. NGOs, Scientifics, local communities, international institutions, private and public sector… every layers of civil society is gathering at Ouagadougou to debate and share their respective positions on land degradation through desertification combat, biodiversity protection, adaptation to climate change and the consequences that come from these challenges in every part of the world. For the first time in Africa, this unique multi-actors manifestation brings together 300 participants from all around the world during 4 days. 4 themed workshops : This edition, 4 themed workshops are proposed: the Great Green Wall Initiative, pastoralism, land property & neutrality, multi usages of water. International institutions representatives, regional initiatives, elected representatives of civil society. 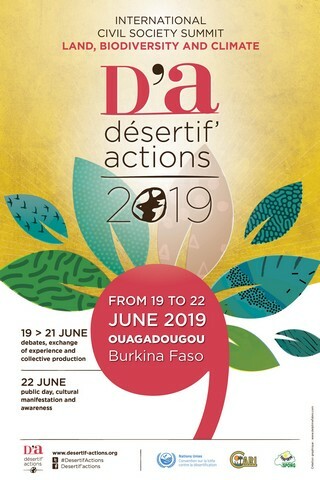 D'a19 is the opportunity to exchange with a variety of high level actors. organizers: CARI ONG, 'Sécrétariat Permanent des Organisations Non Gouvernementales' , United Nations Convention to Combat Desertification. Taking advantage of the location of Montpellier on the Mediterranean coast, this 2019 edition will be an opportunity to focus on precision farming applied to small Mediterranean farms. This edition will also focus on agriculture in the South. Among the announced keynote speakers: Dr Benjamin K. Addom (Team Leader, ICTs for Agriculture at CTA, Netherlands), Alexandre Escolà (School of Agrifood and Forestry Science and Engineering, Polytechnic School of the University of Lleida. Catalonia, Spain), and Jean-Baptiste Féret (Irstea, TETIS joint research unit, France). Organized by MontpellierSupAgro, IRSTEA, DigitAg, Chaire AgroTIC. The Second International Crop Modelling Symposium (iCROPM2020) will be held February 3-5, 2020 in Montpellier, France. Four years after the 1st International Crop Modelling Symposium in Berlin (iCROPM2016), crop modelers from around the world will meet at the iCROPM2020 Symposium in Montpellier, France to exchange on advances in crop modelling and identify challenges and new opportunities for future research. iCROPM2020 will focus on recent improvements and applications of crop simulation models to better support agricultural production and food security under global change. All types of crops and cropping systems (arable, grasslands, intercrops) and world regions will be considered, including high and low inputs systems, with relevance for large agricultural enterprises to smallholder farmers.